Blade length : 51.6 cm or 20.315 inches. Sori :0.9 cm or 0.354 inches. Width at the Kissaki : 2.27 cm or 0.89 inches. Kasane : 0.657cm or 0.259 inches. Era : Nanbokucho period. 1362.
and Chirimen style jigane and Utsuru appear on the Ji. Hamon :konie deki suguha with small ashi and Nezumi ashi. Boshi:Notare and small round shape. and more older sword which was made middle Kamakura to Hean period is called Koaoe school. 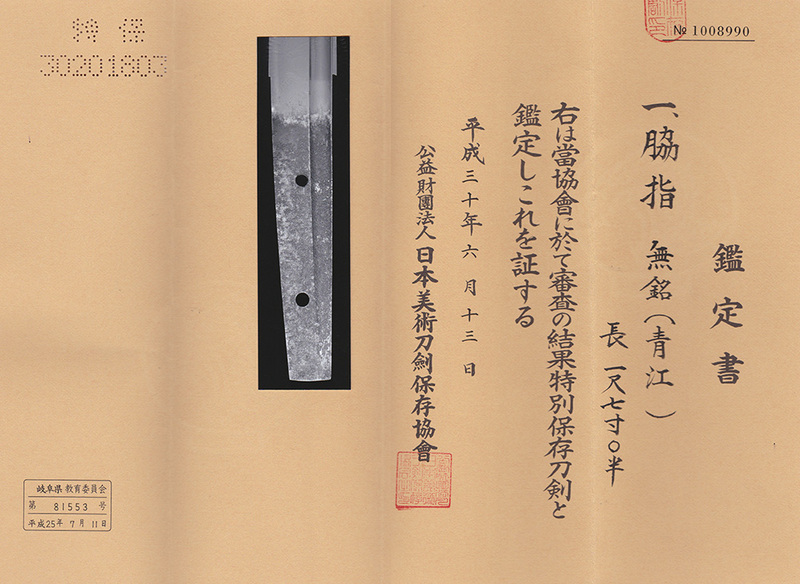 This sword belonged to Nanbokucyo period Aoe school. This sword has typical special feature of Aoe school Chirimen hada with utsuri and notare round shape missaki. Saya :Black roiro kizami saya. Tsuba :On the round iron Tsuba, Japanese drum and Tsuzumi(Japanese instrument) and others are engraved. Menuki : a shishi dog is engraved by solid gold? From Aoi Art:Generally Aoe school made Suguha hamon like this sword. The sword has utsuri on the ji and bright haon and clear. Bo-shi is notare and then round shape. Recently it is rather difficult to buy Aoe school sword. The sword has small sumihada and rather hard feeling than Bizen school. Tha hamon is bright and clear and also typical shape of Aoe hamon. The Koshirae will be fitted for this blade and also good condition and nice quality.